The heavily disputed Ferrari 375 Plus on display in England. 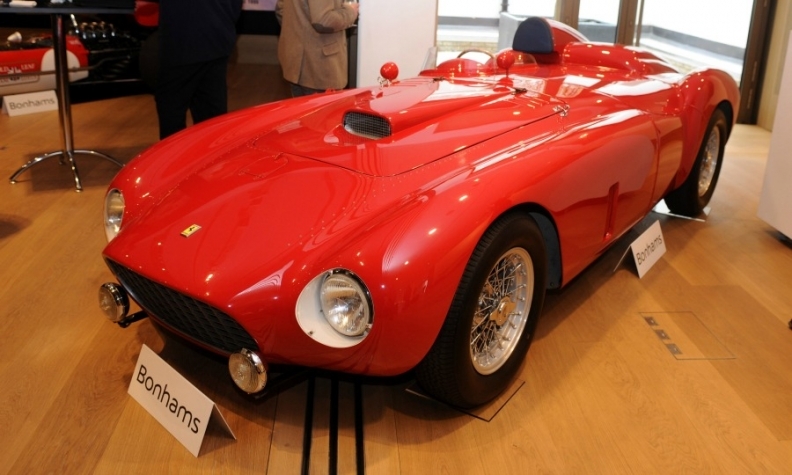 (Bloomberg) -- Wanted: one caring owner for a cherry-red 1954 Ferrari racer; current proprietorship heavily contested. When an eccentric U.S. Army engineer who worked on the Manhattan Project during World War II bought a burned-out Ferrari chassis for $2,500 in 1958, he had no idea that it would become the most fought-over car on the planet. Now, after 16 years of lawsuits and ownership claims from Paraguay to Switzerland, the fate of the roadster, which Victoria's Secret founder Les Wexner thought he bought last year for 10.7 million pounds ($16.5 million), is finally coasting toward resolution in a London court. Ferrari made just five 375 Plus models that year and only four of those gleaming symbols of motor racing's golden age remain. Fashion designer Ralph Lauren and candy billionaire Giorgio Perfetti have two of them. "This vehicle, along with a number of others, has entered into the realm of fine art," said Dave Kinney, publisher of the Hagerty Price Guide for classic cars. The move toward closure of the case comes amid a surge in the value of vintage Ferraris. A 1962 250 GTO fetched $38.1 million at auction last year, the most ever for a car. Hagerty's Ferrari Index of 13 models has more than tripled since 2010, peaking at $5.4 million in May. The last undisputed owner of the 330-hp 375 Plus was Karl Kleve, the army engineer-turned designer, artist, serial tinkerer and author (of a book linking baldness to blood circulation). Kleve, who died in 2003 at the age of 90, bought the car's damaged body from the heir to the Kleenex tissue fortune, Jim Kimberly, to add to his collection. It languished on a trailer outside his home near Cincinnati, Ohio, for three decades before it was stolen sometime between 1985 and 1989, according to court documents. Shortly thereafter, the Italian machine, or at least part of it, turned up in Antwerp via Atlanta, where it had been acquired by a Belgian trader. Customs officials there impounded the car to determine its ownership after Kleve reported it stolen, but authorities sided with the trader. Once cleared, it was sold to another Belgian, Jacques Swaters, a Ferrari dealer and former racecar driver, for an undisclosed sum. Not knowing it had been purloined, Swaters, who considered Enzo Ferrari, the automaker's late founder, a close friend, spent years restoring the car and its Barchetta-style aluminum bodywork to racing form. In 1999, after Kleve located the vehicle and confirmed his ownership by its chassis number, 0384M, Swaters agreed to pay $625,000 to keep it. "It's a car worth fighting for," John Collins, owner of UK Ferrari dealer Talacrast, said by phone Thursday. "It's an important car." A decade later, after both Swaters and Kleve died, a daughter of Swaters filed a suit in Ohio arguing that Kleve violated the sales agreement by withholding some of the car's parts, according to court documents. That claim of ownership was followed by two others -- one by a fellow Ohio resident and the other by a U.S. citizen living in Switzerland. In 2013, the four parties jointly agreed to "extinguish all claims and counterclaims" and allow Bonhams, one of the world's oldest auction houses, to sell the roadster so they could split the proceeds. And so last June, after an extensive marketing campaign, it was sold to Wexner, the lingerie billionaire, at an auction at the historic Goodwood Festival of Speed in the English countryside. But the bickering didn't stop there. Wexner sued Bonhams after the sale, claiming the auctioneer had failed to inform him of unresolved ownership disputes and demanding a full refund plus damages. Bonhams, for its part, sued Kleve's daughter, Kristine, for allegedly breaching the terms of their settlement deal prior to the sale. And that's not all: Bonhams is also suing a Paraguayan car dealer for deceit. The dealer, the company said in a complaint, sent a letter three days before the auction claiming ownership of the Ferrari. The auction house, anxious to avoid canceling the centerpiece of the Goodwood Festival, allegedly paid him 2 million pounds, according to the documents. All four lawsuits related to the roadster in London have now been folded together so a judge can settle the disputes once and for all. The next hearing is scheduled for September. Lawyers for each party involved either declined to comment or didn't respond to emails seeking comment. While Kleve may not have foreseen the extent to which people would one day go to possess his once-battered chassis, he certainly would have appreciated the passion behind it. He started his collection in 1939 with his mother's black 16-cylinder 1936 Cadillac, according to an obituary in the Cincinnati Enquirer newspaper. By the time his Ferrari was stolen, the collection was so vast that his neighbors had started to complain, prompting a court to order him to clear his yard. "Do you know anyone in America who's limited to two cars?" Kleve asked the judge in 1990, according to the newspaper. "Especially one who loves cars? Cars are my life."